CycleHack is a grassroots movement that promotes accessible cycling. They come up with all sorts of clever 'hacks' that make getting around on a bike a bit easier for everyone -- we love the Penny In Yo Pants solution for cycling in a skirt. The CycleHack team recently published a digital tabloid newspaper about their project and you can read the full issue online. 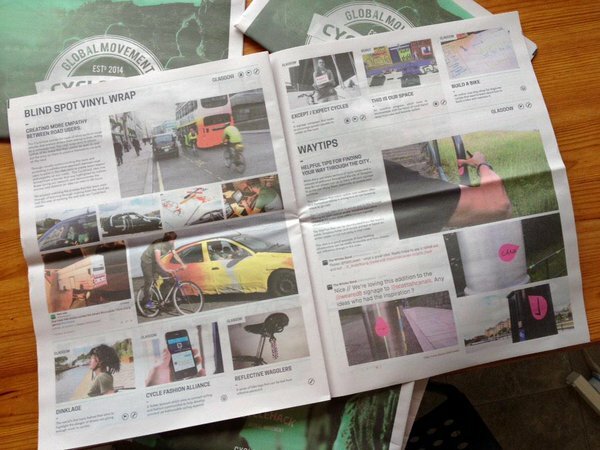 "CycleHack recently published their annual for 2014 with Newspaper Club. We're a 48-hour global event that looks to reduce barriers to cycling by bringing people together to prototype solutions that solve these, set up by Sarah Drummond, Matthew Lowell and Johanna Holtan. In 2014 we brought over 100 people together in Glasgow and concurrently ran the hack in Beirut and Melbourne. 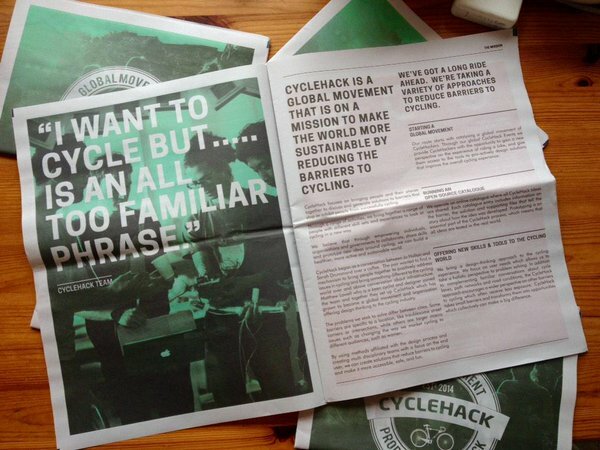 In 2015 we go truly global with over 40 cities signed up to run CycleHack." 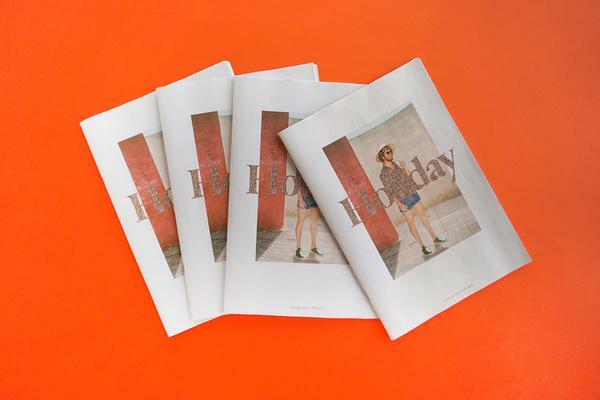 "We chose to work with Newspaper Club and the newsprint medium because it adds that extra special tangibility to what you're doing. 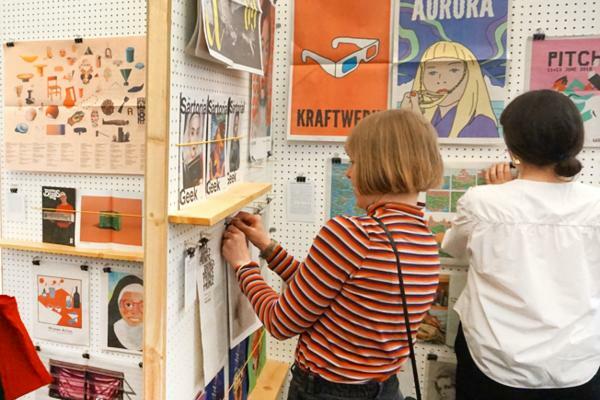 At the end of each hack our participants upload their prototype examples to an online catalogue to share with the world, we wanted to bring that into newspaper form to allow people to browse and create an annual of sorts for documenting CycleHack on a yearly basis." "The process of producing the newspaper focused us as a team to sit down and think, 'what do we want to say about who we are?'." "It was tough and cathartic and over and above the content on the hacks we produced, really forced us to say 'What do we do? How do we present ourselves?' The production of the newspaper led to a larger critique of our business model, our narrative and our presentation." 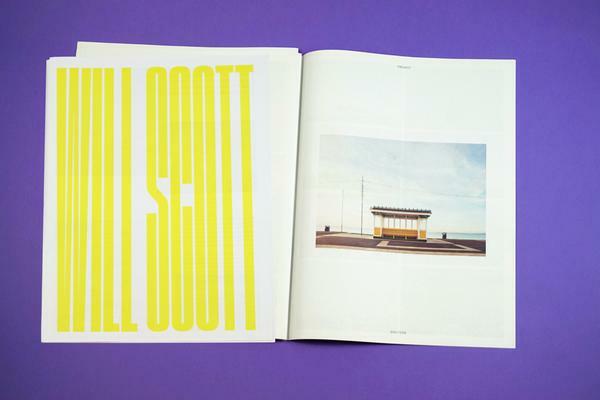 "Our papers have gone like hot-cakes with everyone who sees a copy in our studio asking to have one. In a world where emails, PDFs, websites are sent to us, and our spam folders countless times a day, using Newspaper club has ensured we retain that little something special about our content that people take the time to find out about." 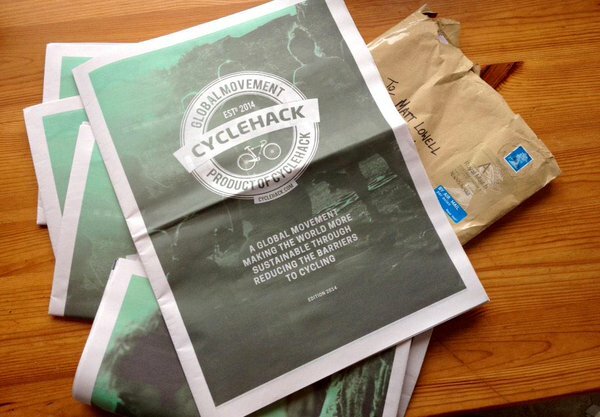 If you're a cyclist you can keep up with CycleHack on Twitter. Thanks for printing with us! All images courtesy of Matthew Lowell.